The Analysis Designer option in the Analytics tab enables you to specify parameter options and run a view based on those options. The available parameter options are grouped into five sections: Layout, Groupings, Data, Filters, and Report. 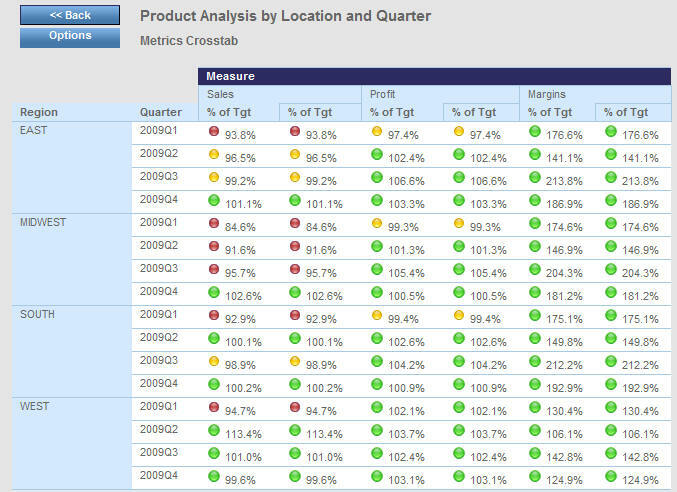 In the Filters section of the Analysis Designer, you can filter the view by selecting any combination of specific values including time, product, scorecard, objective, perspective, theme, metrics, location, organization, and measure. If you want to select multiple measures, click the browse (...) button to the right of the Measure drop-down menu and the Multi-Measure Selector dialog box opens. Note that you can force the report to always use the selected scorecard by selecting the check box next to Scorecard in the Analysis Designer. Leaving the check box clear allows an end user to pass the scorecard they wish to view at run time. In the Report section of the Analysis Designer, you determine the output format by selecting to display the view in a browser, a PDF file, an Excel spreadsheet, or a WebFOCUS HTML active report which can be sent to end users for offline analysis. Enter a report name at the top of the Analysis Designer so it can be saved for future use. To run the Metrics Across Dimension view, select Analysis in the Type drop-down menu of the Analytics tab and then select Analysis Designer from the View drop-down menu. 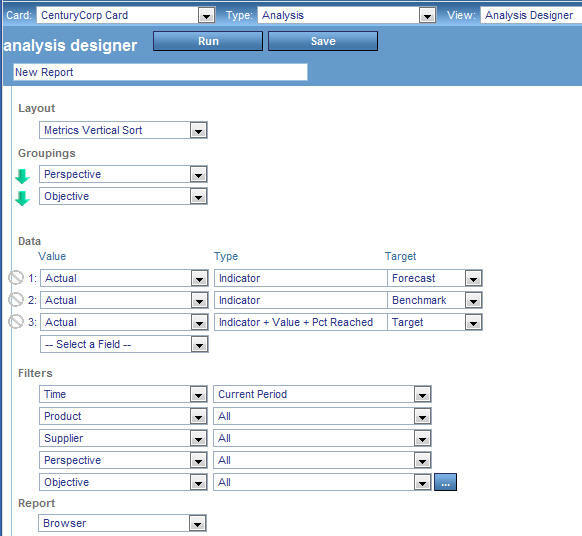 The Analysis Designer opens where you select the desired report template and specify your parameter options. Enter a report name in the field provided, for example, Product Analysis by Quarter. From the Layout drop-down menu, select Metrics Across Dimension and then select the desired parameters in the Groupings and Filters sections, as shown in the following image. To run the Metrics Analysis, first select Analysis from the Type drop-down menu of the Analytics tab and then select Analysis Designer from the View drop-down menu. The Analysis Designer opens where you select the desired report template and specify your parameter options. Enter a name in the field provided, for example, Product Analysis by Month. From the Layout drop-down menu, select Metrics Vertical Sort, and select the desired parameters in the Groupings and Filters sections. In the Data section, in line 1, select Actual for Value, Indicator for Type, and Forecast for Target. 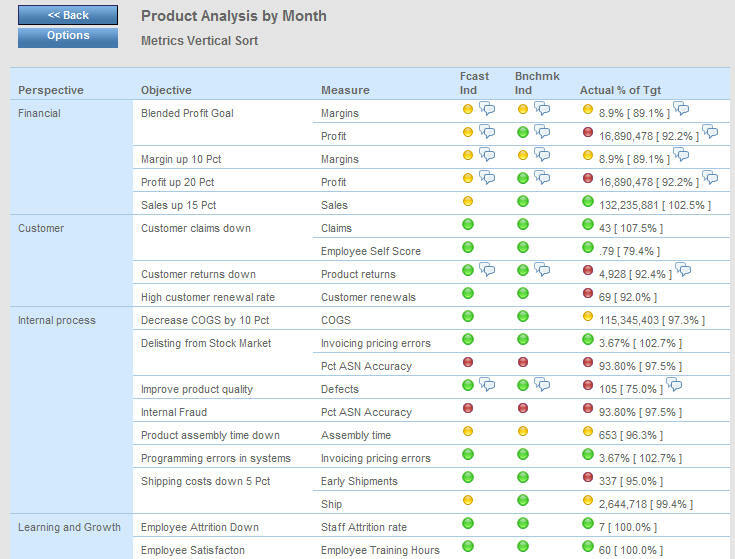 In line 2, select Actual for Value, Indicator for Type, and Benchmark for Target. In line 3, select Actual for Value, Indicator + Value + Pct Reached for Type, and Target for Target. The following image shows the Analysis Designer with all selected values for this view. Click Run to execute and open this view in a new window. The following image show the Metrics Vertical Sort view for the selected parameter values. To run the Metrics Analysis, first select Analysis from the Type drop-down menu of the Analytics tab and then select Analysis Designer from the View drop-down menu. The Analysis Designer opens where you select the desired report template and specify your parameter options. If you click the browse (...) button to the right of the Measure drop-down menu, you can select multiple measures to personalize the columns you want displayed in the output. Enter a report name in the field provided. From the Layout drop-down menu, select Metrics Crosstab, select the desired parameters, and then click Run to execute and open this view in a new window. 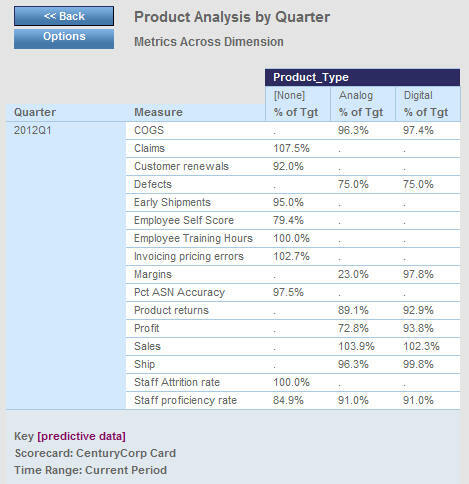 The following image shows an example of the Metrics Crosstab view. If you create personalized trend periods using the Time Ranges capability of the Manage tab, those values will be available in the Filters section of the Analysis Designer. For more information, see General Tab - Time Ranges. 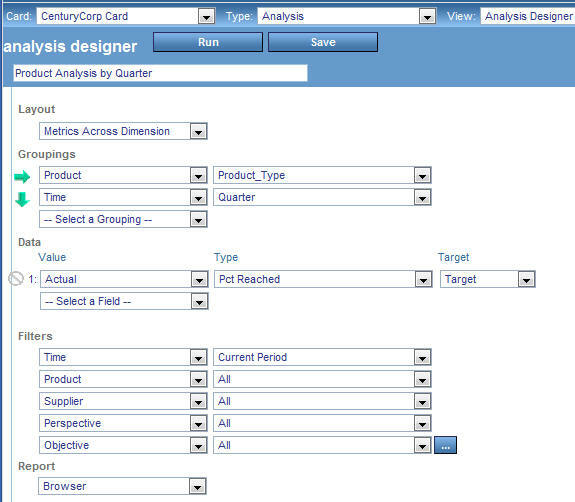 These options can be found in the Data Type drop-down menu of the Analysis Designer, as shown in the following image. To set up Ranking, first select Analysis from the Type drop-down menu of the Analytics tab, then select Analysis Designer from the View drop-down menu. The Analysis Designer opens where you select the desired report template and specify your parameter options. If you click to the left of the data field of the Value that you want to rank, a ranking button appears, as shown in the following image. Analysis Designer reports that have been user-categorized will appear in the View drop-down menu in the Analytics tab for the categories to which they have been assigned, as shown in the following image. You can change the categories of any saved report. To add a category to, or remove a category from a saved report, first select Analysis from the Type drop-down menu of the Analytics tab and then select Analysis Designer from the View drop-down menu. Click Open and select the report from the Report Name drop-down menu. Click OK.
Click the Categories field and select the desired categories from the drop-down menu. To remove a category, click the X next to the category name. Click Save once you are done making changes. The report will now be listed in the View drop-down menu under the new categories selected. To run a saved view, select Saved in the Type drop-down menu of the Analytics tab, select the name of the saved view from the View drop-down menu, and then click Run. The following image shows the drop-down menus used to retrieve a saved view. You can change the parameters of any saved view. To edit a saved view, select Saved in the Type drop-down menu of the Analytics tab, select the desired saved view from the View drop-down menu, then click Edit. The Report Options panel opens where you can change your parameter options. After you are done making changes, run the view to test the results of your changes. If you are satisfied with the results, click Save.